One name, Amjadi Begum, associated with the Indian Freedom Struggle needs no introduction. Principled, patriotic, self-respecting, honest, dignified, truthful, courageous, determined and committed to the cause are all the attributes which direct us to that great personality whom we all know as Amjadi Begum. Amjadi Begum with delegates at Muslim League Governing Council’s Lahore session. Amjadi Bano Begum was born in 1885 in a devoutly religious family of Rampur. Her father, Azmat Ali Khan, worked as a high official with Rampur State. Amjadi Bano lost her mother at a very young age and was brought up in the care of paternal grandmother and paternal aunts. She received her primary education at home. Having a large and rich collection of religious books at home she helped herself achieve an extensive study of religion. In 1902, when she was 17 years old, Amjadi Begum was married to the great freedom fighter Maulana Muhammad Ali Jauhar who at that time was studying in Oxford University. Begum Sahiba’s greatest achievement in association with Maulana Muhammad Ali Jauhar’s mother Bi Amma, was to create political consciousness among Indian women. In 1917 she attended the annual session of All India Muslim League. In 1920 she was appointed as Secretary (women’s wing) of All India Khilafat Committee. During this time Begum Sahiba and Bi Amma collected a contribution of Rs. 40 lakhs for the Khilafat Movement. About the contributions of Indian women at the national level, Gandhiji, in his Young India of 29 November 1921, wrote a special article about Amjadi Begum entitled ‘A Brave Woman’. In it he wrote, ‘While working with Begum Muhammad Ali I had important experiences. Only last year she started helping her husband in his public affairs. It started with raising funds for Khilafat Movement. Since then she has been with us during our torturous journeys to Bihar, Assam and Bengal. I can say it with all the surety that she is in no way less skilful in oratory than her husband. In Madras on the seaside, a huge public meeting was organised. She delivered a speech on top of her voice that was heard intently and appreciated greatly by the public.’ [Translated from Urdu and not an original quote]. While Maulana Mohammad Ali was languishing in jail, all of his affairs outside the jail were managed by his mother and his wife. 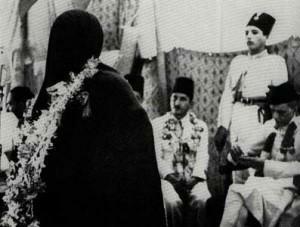 In 1930 Amjadi Begum attended the Round Table Conference along with her husband in London. Later she joined All India Muslim League and was also elected as a member of its working committee. After her joining the Muslim League all the other thousands of workers who were the fans of Muhammad Ali also took up its membership. 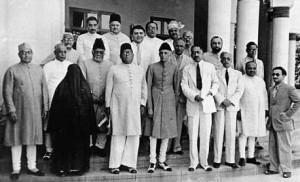 All India Muslim League’s annual meeting of 1937 in Lucknow was held under the chairmanship of Begum Maulana Muhammad Ali Jauhar. In its annual meeting in Patna in 1938 when Muslim League formed its women’s wing and constituted a women’s working committee then it was her that was appointed as its president. Following this on the occasion of Muslim League’s historic annual meeting in Lahore in March 1940,an annual meeting of All India Women’s Muslim League Committee was held on 23 March at Habeebia Hall, Islamia College, Lahore attended by leading Muslim women activists from all over India. At this meeting Begum Amjadi Bano was elected as its president and women’s leader. For the welfare of women she established a Khadi Bhandar at Aligarh. In order to spread the message of freedom of the motherland she launched an Urdu daily Roznama Hind edited by her. It carried interesting and high quality articles. When Khawaja Abdul Majeed Saheb was arrested she took upon herself to supervise the tasks of Jamia Millia Islamia that he used to look after so that Jamia did not have any problem in running its affairs. One of the major contributions of Begum Sahiba was also the establishment of Hameedia Girls School in Allahabad. Even today this school, now known as Hameedia College, continues to serve women’s education. Begum Amjadi Bano had played important role in the general elections of 1946. She also contested and won a seat in UP on Muslim League’s ticket un-opposed but, sadly, on 28 March 1947 only a few months before the country was liberated from the chains of slavery she departed from this world for her heavenly abode. All her life she struggled for the independence of her country and went on to leading the community in the right direction. It is in only in centuries awhile that a woman of her stature and strong will and determination is born to a nation. It would not be wrong to call her the only woman leader of her time. This is the duty of all of us to acquaint the new generations with Begum Sahiba’s political, social and educational achievements. On the death anniversary of her I pay my sincere tribute to Begum Sahiba.